If you love nachos but don't love the fat and calories in them here's a healthier swap for the chips: potatoes! Wash and pat dry one medium potato per person. Thinly slice potatoes with skins on (can peel if you prefer). Spread slices out on a oil sprayed cookie sheet. Drizzle a little olive oil over the potato slices and toss to coat. Salt. Bake for about 15 minutes, turning once to brown on both sides. Remove when potato slices are golden brown. Top with your favorite nacho toppings. 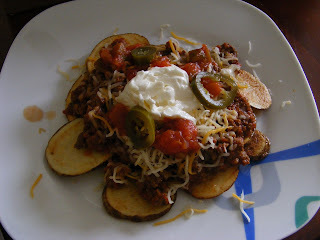 I like leftover chili, shredded cheese, sour cream, salsa and jalapenos. One medium potato has only 100 calories, NO fat, and 3 grams of fiber. Much better for you than greasy chips. Ole! Yum! I make "taco potatoes" often by just putting the taco fixings onto a baked potato, but I like this idea a lot too! I bet my family would love it!